Home » Photography Tutorials » What is Field Curvature? In a simple field curvature scenario like above, the light rays are perfectly focused in the center of the frame, at Image Plane A (where the sensor is). Since the image is curved, sharpness starts to drop as you move away from the center, resulting in less resolution in the mid-frame and much less resolution in the corners. The circular “dome-like” image in three dimensional form is shown to the right of the illustration. If the corner of the image is brought into focus, which would move the image plane closer (Image Plane B), the corners would appear sharp, while mid-frame would stay less sharp and the center would appear the softest. The effect of field curvature can be very pronounced, especially with older lenses. 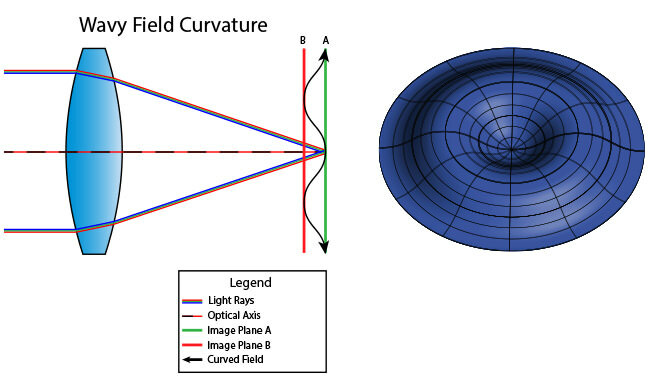 Like other optical aberrations, field curvature is not limited to photographic lenses – it can be seen in microscopes, telescopes and other optical instruments. While it was possible to bend the image plane with film cameras and compensate for field curvature, it is no longer possible to do that on flat digital image sensors. On top of that, with increased sensor resolution on recent digital cameras, the effect of field curvature is even more relevant and evident today. Lenses with wavy field curvature can show sharp center and corner performance, but soft mid-frame performance. If you look at the above illustration, you will see that the shape of the curved image starts out touching Image Plane A in the center, where it is perfectly in focus. Then the image curves in the mid-frame and comes back again in the corners. Hence, if you focus in the center, both the center and the corners would appear sharp, but the mid-frame would appear softer in comparison. If you focused in the mid-frame, which is where the Image Plane B is, the mid-frame would appear sharp, while both the center and the corners would appear softer. This sort of field curvature is a very common occurrence in modern lenses, even professional lenses worth thousands of dollars (see more on this below). Also, field curvature behavior can vary by distance. Some lenses look good at short range with practically no visible curvature, while exhibiting a rather strong level of field curvature at infinity. 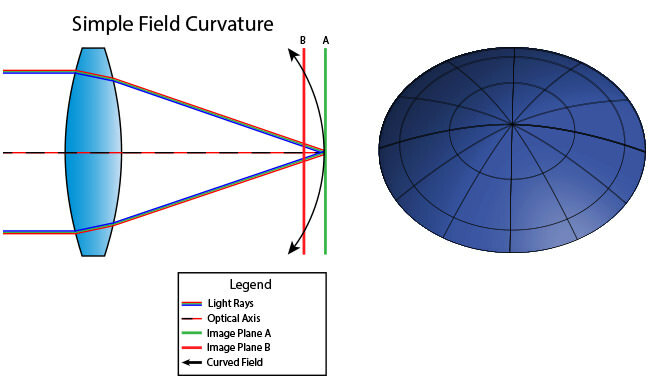 The effect of field curvature varies by lens design. Short range lenses (ultra wide, wide and normal) below 50mm typically suffer from curvature problems the most. Telephoto lenses, on the other hand, often have very little or no visible field curvature. You might be wondering if the lens(es) you use have field curvature. Before you start your search, you should know that every single lens has field curvature – some stronger than others. While modern optical designs take field curvature into consideration and have specific elements within the optical design to reduce it, most lenses still suffer from it. In fact, even many expensive professional lenses from well-known brands (Nikon, Canon, Zeiss, Leica, etc) have very pronounced field curvature. Wide open at f/1.8, the lens suffers from visible field curvature. The center appears sharp, while the mid-frame is much softer in comparison, with corners being better than the mid-frame (if I focused in the mid-frame, both the center and the corner would appear soft). It is a strange thing to see, but this is not the only lens that suffers from such curvature – other Nikon lenses, even the much more expensive Nikon 24-70mm f/2.8G have a similar problem. Like other optical aberrations such as Chromatic Aberration, the best way to reduce field curvature is to stop down the lens. If a lens has small to moderate amount of field curvature, stopping down a little will significantly reduce it. But if a lens suffers from heavy field curvature, then you might have to stop down to f/8 or f/11 to reduce it. Sometimes even stopping down to the smallest aperture (at which point diffraction kicks in) does not fully eliminate it. As you can see, both center and mid-frame appear much sharper, but the mid-frame is still a little weaker in comparison (which is normal). Unfortunately, it is impossible to fix field curvature in post-production software such as Photoshop and Lightroom. It is a well known fact that lenses perform the best in the center of the frame and their image quality can deteriorate toward the edges. 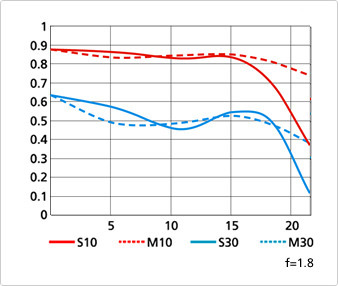 In fact, optical performance of lenses is often assessed by the uniformity of sharpness across the frame, so it is a fairly common practice for lens reviewers to demonstrate center and corner performance using various test charts. The problem with most such assessments, however, is that they do not take field curvature into consideration, often arriving at wrong conclusions. When it comes to testing lenses, there are typically two methods. The first method involves focusing in the center of the frame and then looking at both the center and the corner when evaluating sharpness. The second method is to focus in the center and then focus in the corner separately to assess each separately. Some will acquire focus in the center, mid-frame and corner separately. Both methods can potentially lead to different results and conclusions. The first method would show terrible performance on any part of the image frame that is subject to heavy field curvature, while the second method would show what a lens can potentially resolve in individual parts of the frame, but not the image as a whole. When testing lenses, our team at Photography Life always uses the first method, which is to acquire focus once in the center and then assess the performance throughout the frame. We believe that this method is the only proper way to assess lens performance, because it takes the effect of field curvature into account. If a lens suffers from heavy field curvature, the numbers for corner and potentially mid-frame will be significantly lower. If we were to focus on each section of the frame separately, it would hide the effect of field curvature, which we believe is a serious optical issue to disregard. In addition, when working on the field, one would rarely acquire focus in the extreme part of the frame, separately from the center. Most autofocus systems are designed to be close the the center of the frame. The only potential problem with our lab assessments is the fact that some lenses show pronounced field curvature at close distances, but have almost none at infinity (important to know for landscape photographers). We are certainly aware of this particular dilemma and we are working on adding additional test results to provide field curvature data for both close focus and infinity. Hence, providing test data only for close distances, or only for subjects at infinity does not provide enough information to fully evaluate the effect of field curvature. Or there was a Canon kit zoom 28-90 or 85 (came with EOS 300 in 2000) that would be the best example ,I’ve never seen a worse lens in my life :) ,If only I had a Canon digital body the lens is still lying in box. First time I heard this from my Dad who returned a 4×5 Schneider lens that it was too faulty and a field camera could not take better pics.The other sample was OK ,so I guess maybe it can be from sample to sample too ? In layman terms can we say it “dull distorted glass effect” ? Interesting read Nasim, I cant say I ever pixel peep in the corners, and I think I have a long way to go in my photography before worrying about corner sharpness too much. Its good to learn though and I enjoy your writing style, its easy to read whilst not avoiding technical details. Many thanks, and good to see you are posting again! Thanks for this article — field curvature is probably my #1 concern with lenses because I am usually shooting landscapes where corner-to-corner clarity is important and because there is no easy way around it. When I originally got my D800E I was very much looking forward to using the 24 PC-E on it, but I rented the lens for some testing and found some very clear and dramatic field curvature (in fact, using that lens at full tilt makes the actual curvature very easy to see). Focus bracketing helps, but I always prefer one image and at most a few for either focus stacking or dynamic range. I’m finding your site to be one of the best when it comes to reviews, and I’m glad you give this issue the attention that it deserves. This article confirms the usefulness of live-view where the focus point can be put anywhere in the frame. This is perhaps the only way to assure that subjects away from the center are rendered in the sharpest focus with any lens, no matter the degree or type of field curvature. Along with this is the need to consider where the sharpest focus points within the field curvature of a lens occur within the depth of field at the aperature the image is taken. Thankfully we can easily review this, especially on EVF cameras, but even with the rear LCD using loupe viewing tools such as Hoodman, etc.. The subject of a future article perhaps? Nasim, I recall you wrote an article about how to focus off-center subjects? Perhaps you could link to it at the end of this article for those that didn’t read it? Thanks for this write up Nasim. I had noticed the effects of field of curvature on my 18-55 kit lens long back but I dint know the reason behind this optical issue. Nasim, thanks for informative article. But, man, you shall add axis labels to the chart! This is elementary school basics. Would help beginners to understand MTF charts. However, as I proposed further down, an own article about “how to read MTF-charts” would probably even more useful. Mark, FYI, finally just published my “how to read MTF charts” article! Alex, I apologize for assuming that our readers know how to read Nikon MTF charts :) I will post an article on reading MTF charts later this week! Wouldn’t this render the subject noticeably out-of-focus when shooting using Focus and Recompose technique? Thanks for the explanation, but I have a question: Could you write a beginners guide article about how to read MTF charts? I was searching the internet, but found nowhere an explanation which I understood. Mark, great idea – I am working on an article on how to read MTF charts! Great Article, So can I conclude that there is no permanent fix for Field Curvature?? if a brand new lens is having this issue, it should be replaced by the manufacture? Would this issue occur later after couple of months or years? Its a physical characteristic/property which is never perfect. I had a question related to the above if you could kindly clarify. What happens when you use a non-center focus point particularly one that is in an area affected by the field curvature; would the camera put the focus at focus plan A or B (reference to the images above)..
– Focusing with the center point and recomposing seems to produce better results than using any of the right or left focus points..
My being familiar with optics and field curvature, I have an unusual situation. I have a wide angle rangefinder lens that exhibits extreme field curvature, being most prominent at longer subject distances although it can be detected at almost any distance. The lens is set up to backfocus so that if the center of the frame’s subject is focused on, it will be in well in front of the zone of focus (due to backfocusing) but the sides and edges of the frame due to the extreme field curvature are placed perfectly in the depth of field and are razor sharp. I suspect if the backfocus is corrected enabling the center part of the frame to rest within the depth of field, the outer zones of the frame due to field curvature will be well in front of the zone of focus and be severely soft. Any thoughts? Is there any more significance that “wavy” field curvature is more pronounced at 30l/mm, rather than at 10l/mm? Are you sure that the MTF curve is conclusive with regard to field curvature? It seems to me that the MTF info does not differentiate between lower resolution due to variations in focus across the field and sheer variations in the resolving ability of the lens itself; and stopping down tends to mitigate these variations with most lens designs. A question that bother me is whether shorter flange distance such as Sony’s E mount mirrorless cameras will result in more field curvative issues that require a higher lens design skills and if result will be improved using A mount lens via adapter . I note that it seems harder to get evenly sharp images across the frame with E mount cameras and that even expensive lens suffer from quality issues . Curvature of field is actually not reduced by stopping down. The increased depth of focus when stopping down masks it, so that it is not noticeable. Also, zonal softness can be caused from spherical aberration, while leaving the marginal and paraxial areas sharper. So if you see a photograph that appears to have uniform super sharpness, can one say that a good lens was used, the photographer stopped down, and/or the image was cropped? What about medium format or 4×5 or 8×10 cameras?